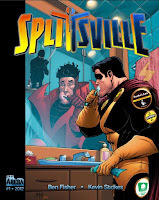 The Fellowship was fortunate enough to obtain a copy of SPLITSVILLE #1 from Arena Comics. Ben Fisher wrote the story with pencils by Kevin Stokes and inks by Adam Markiewicz. Meet Los Angeles’ resident hero Stalwart. 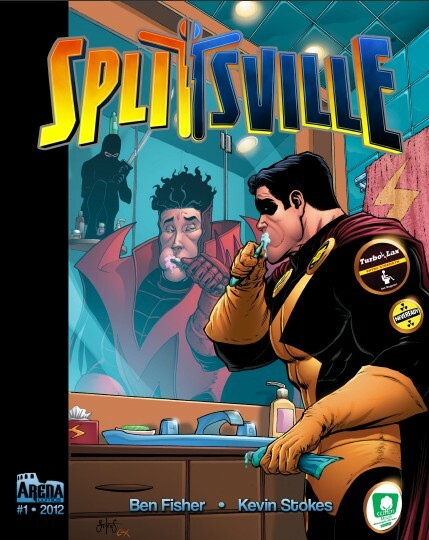 He has a secret that not even HE knows…a split personality which is his arch nemesis Master Mayhem! Only Stalwart’s sidekick Vex and Master Mayhem’s assistant Tiger Mom know the truth. When new hero Blastcap shows up and disturbs the balance, Vex and Tiger Mom must join forces to resolve this situation, at all costs! And what is with the ninja who keeps attacking Stalwart? This is the first comic from a new publisher Arena Comics, and the company is off to a great start. While heroes with split personalities is not entirely a new concept, having your arch nemesis being one is almost unheard of. Fisher’s decision to have the sidekicks/assistants in on the secret and working together to protect it is definitely a great wrinkle. It will be interesting to find out Blastcap’s motives…does she really want to be Stalwart’s partner or does she want the publicity that will come from working with him. Stokes' art is very nice, worthy of any superhero title. A fun read overall!